In a recent CNN commentary, titled "What We Learn From Doodles," Sunni Brown makes a compelling case for more improvisational drawing in our daily activities. Brown, an author and informational designer, tells the 2011 Long Beach TED conference that students and business leaders can use free-form creativity to reinforce their own cognitive development. Doodling can increase retention and make visual connections between ideas. Brown points to an article in Science magazine that emphasizes the appeal of doodles to different learning styles and student motivation. In fact, adlibbed artwork can foster "innovative and divergent ways of thinking." According to both research and experience, doodling makes impulsive neural connections, and it allows for the imagination to play out in a visual form. So the next time we get frustrated by a student who appears inattentive, scratching designs in his notebook, we might think twice about scolding him. Brown notes that even Google has an official "Chief Doodler" on its staff, and she sees her own personal mission as "leading the doodle revolution." Check out Brown's other work with Teacher Leadership for the 21st Century. It goes without saying that the American education system is suffering, and the solutions are as diverse as the reasons for the problems. To oversimplify student underachievement as entirely the fault of the teachers misses the mark and seems baked in the political turmoil of whom to blame. If we really want to look forward, then perhaps the education system should take its inspiration from the people, institutions and businesses that promote innovation and change. We continually see education designed around the following traditional sets of words when we describe what and how we teach. What if, as educators, we looked to other sources and broadened our repertoire of ideas? Why not incorporate some of the vocabulary that permeates so much of the literature from business people, think tank gurus, authors, educators, and students? If education is to become more global in scope, the words used to describe it need to reflect that view. Interestingly, too, these ideas appear again and again in tweets, blogs and social media. We can argue that literacy is at the core of the common classroom, but the literacies that pervade the reality of our “born digitals” are much less traditional. To truly make a difference in student learning, we need to start looking at ways to incorporate different ways of thinking. In designing new approaches to teaching that are not hampered by the usual standards, we can expand the minds of our students. Perhaps we should place creativity at the core and build on the literacies needed to think differently. Global innovation in education is more than just three things, but each of the sets of words and ideas above are a good place to start. We use a lot of charts and graphs in our classes, to assess the changing world and to develop skills of visual analysis. Teaching children to decode, create, and apply data visualizations can foster some of the most valuable skills they will need for future use. Our middle-schoolers, for example, use census data to compare pre- and post-Civil War production in farming and manufacturing. In the past, they have also graphed exports of colonial raw materials and increases in 1800s industrial goods. The NCES Kids Zone and the U.S. Census for Kids both contain terrific resources for elementary and middle school students. 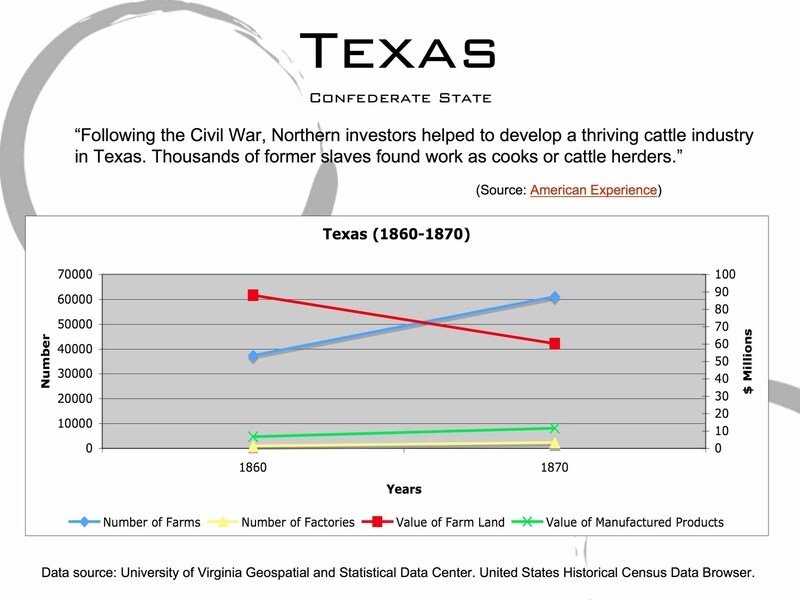 On their websites, users can instantly generate graphs with colorful, interactive tools. One of our other favorite sources of facts and figures is the six-volume Almanac of American Life, which covers virtually every statistical topic of United States history. Newspapers and magazine rely on graphs to depict current news stories, and political candidates often offer charts to buttress their positions. Republican hopeful Mitt Romney, for example, recently faced media scrutiny over a key graph in his jobs plan. 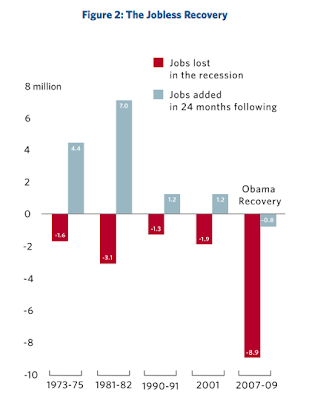 Some commentators complained that the graph was intentionally misleading in assigning blame for the recent recession. A careful examination of the text within the image and within the supporting paragraphs, however, does accurately explain the representation, but an observer needs a honed critical lens to parse the graph properly. Another primary contender, Michele Bachmann, prominently used charts in a January televised speech rebutting the president's State of the Union address. She, too, received criticism over selective use of data, leading to a virtual graph war over which was the most truthful economic depiction. 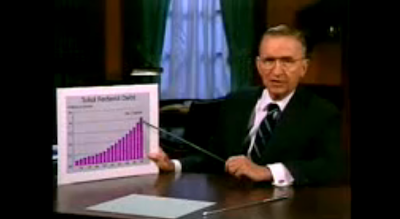 The most renowned and effective political wielder of statistical charts, of course, was 1992 independent candidate Ross Perot. His intensive use of graphs during his paid television segments convincingly made the case for deficit reduction and spending changes. It was a far cry from the typical bluster and voice-overs of most campaign ads, and for 18.9% of voters, it was a welcome change. Legendary NBC newsman Tim Russert also famously used simple whiteboard numbers to explain the complexity of the Electoral College during the 2000 presidential race. His straightforward eloquence and genuine decency made his one of the most respected voices in political punditry. The current hurricane season has brought disastrous flooding and rains to the east coast, as Irene and her tropical cousins have wrecked their way up the seaboard. The wall-to-wall television coverage, interestingly, has offered varying examples of information designs, all centering on the same topic. As we sat glued to the Weather Channel during our 24 hours of calamitous winds, we watched successive layers of storm information, each depicted within a similar geographic and visual frame. 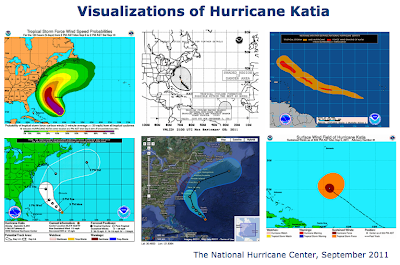 The National Hurricane Center is the clearinghouse for authoritative storm coverage. Its website allows users to access the same data on which marquee meteorologists rely. The Center's value lies in its seemingly endless permutations of visualizations that offer expert representations of wind, rain, storm paths, and potential landfalls. As students of geography and design, we appreciate the Center's care in crafting unique pictorial depictions, all within the same geographic grid. 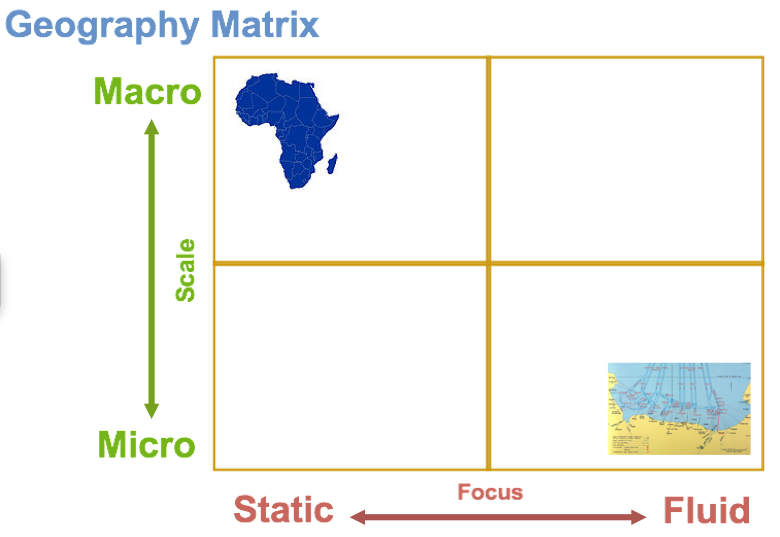 The scalability of maps helps reinforce the value of micro and macro scales. The storm track predictions also confirm the importance of fluid portrayals. Other sites offer educational renderings of hurricanes to teach students about the science behind the storms. 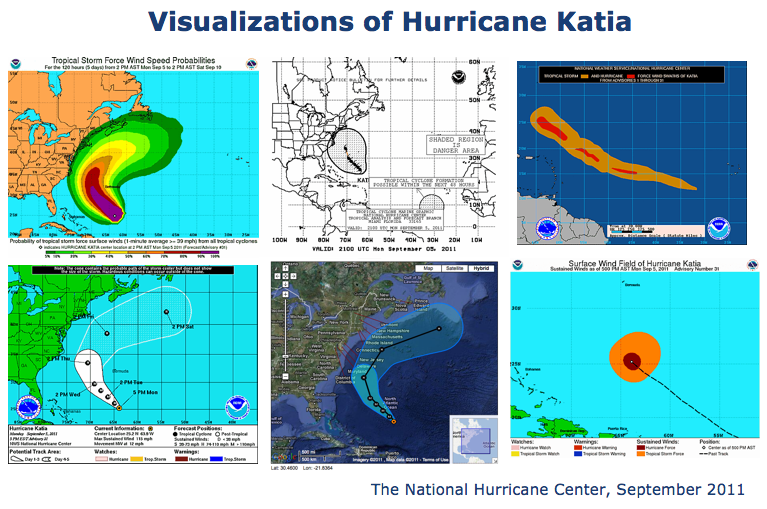 CNN presents a VRML (Virtual Reality Modeling Language) visualization to animate the theoretical eye of a hurricane. Infographic World recently posted a terrific diagram of a hurricane's intricate anatomy. In a different graphic about media literacy, a study of news coverage since 1980 reveals wide disparities between TV publicity and actual hurricane damage. 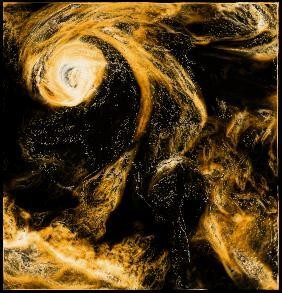 And finally, a fantastic series of illustration-inspired techniques helps computer scientists and engineers at the University of Maryland, Baltimore County (UMBC) visualize the evolution of hurricanes to understand better their storm tracks and intensifications. All of these resources make for great tools in the classroom, to generate discussion and reinforce scientific, geographic, and visual thinking. Three-term Texas Governor Rick Perry entered the Republican race for president comparatively late, given Mitt Romney's seeming campaign-from-birth (or at least since leaving the Massachusetts' governorship in January 2007). As other early announcements were made, many heavy hitters in the Republican party seemed to long for a more formidable player to take on President Barack Obama. Perry leapt into the ring to fill a perceived void of experience and moxy. Thanks to Perry's trademark swagger and right-wing appeal, boosters and foes alike both know him as charging full-steam ahead toward any roadblock appearing in his way. Perry's campaign logo features many of these same hallmarks. Its lettering is confident and obvious, but the overall design seems an afterthought, as though his rushed communications team needed an image to plaster on bumper stickers and, therefore, ran with its first proposed mock-up. The logo's lettering is clear, with Perry's last name featured in puffy, all-caps Times New Roman. The colors are dark red, white, and blue, and a luminous glow gives the oval shape and its emerging stars a shadowed, 3D effect. The purpose of the design, however, is ambiguous. The word "president" appears beneath Perry's moniker in a discordant, oddly kerned, sans-serif font. There is no overt slogan to impart a clear message, and the general impression is fairly bland. Perry's design is inoffensive, but it does not strive for any added value. It fills a space on a podium, but it likely would not resonate with any undecided voter. Much like the hasty entry of Perry himself into the race, his logo seems eclipsed by the silhouette of his own outsized bluster. If he continues his stand at the top of the polls, we would not be surprised to see Perry's team tweak its current image and enhance its visual significance with additional mottos, symbols, or niche references. At the very least, Perry's impulsive brand reinforces his key differentiation from the overly workshopped, corporate stiffness of opponent Mitt Romney. Most traditional geography terms refer to what is shown in a map. They rely on standard categories of political, topographic, climate, economic, etc. Geography labels, however, rarely mention how information is shown. With our students, we like to incorporate additional clarifications that help them understand how geographic information is presented in a map. 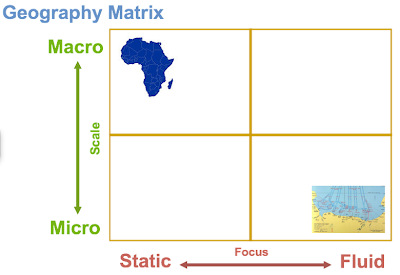 Students can place a particular map within the matrix, according to how they comprehend the scale and focus of a given image (such as the continent of Africa or the D-Day invasion). As they add other maps, they might adjust their prior placements. This practice of fine-tuning reinforces the notion of relational meaning. It offers a great way to encapsulate a host of related maps, such as World War II or colonial settlements or Silk Road visualizations. Interactive whiteboards make this exercise particularly easy, but any tactile interaction would work fine, from PowerPoint projections to old-school chalkboards to cutout pictures on top of construction paper. Diana Laufenberg presented at a TED talk in November 2010. The title of her presentation was "How to Learn? From Mistakes." She posed the question, "Are we really comfortable allowing kids to fail?" For Laufenberg, failure is part of instruction and the learning process. As teachers, we should be talking to kids about this process so they can let their ideas go without the worry of not succeeding. Kids need to know that it is okay to make mistakes and by doing so they will not limit what they can learn. Designing learning to empower students is not about right and wrong answers, but instead it is about expanding the scope of their abilities to think. 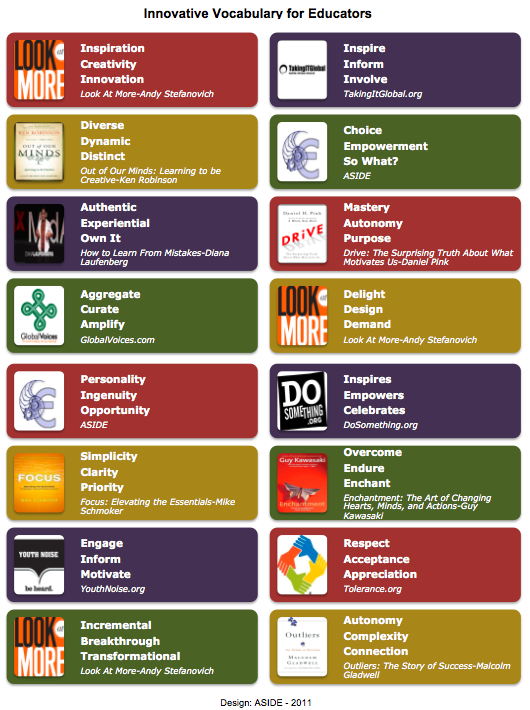 Perhaps it is Daniel Pink’s latest book Drive: The Surprising Truth About What Motivates Us and the subsequent referrals in a host of publications that prompted this post. For Pink, motivation is driven by mastery, autonomy and purpose (MAP). The power of incentives comes from within, which he calls intrinsic motivation, and not from extrinsic motivation, built around rewards. 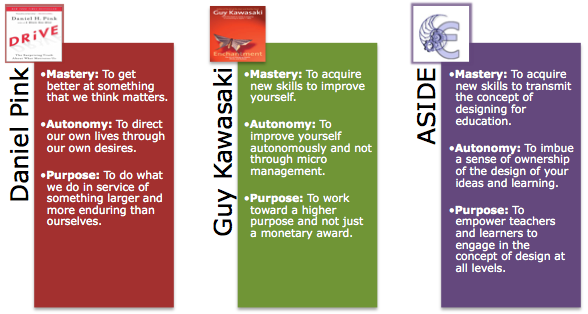 Guy Kawasaki, too, talks about these same ideas in his book, Enchantment: The Art of Changing Hearts, Minds and Actions. He refers to Pink’s MAP and the art of "enchanting down" in a work environment. If you have an enchanted employee, that employee radiates enjoyment and passion to the customer. Think about how this applies to education. If we had more enchanted teachers, wouldn't we have more enchanted learners? 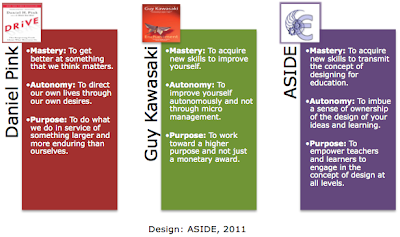 As for the ASIDE blog, it grew out of our desire to infuse curriculum with new approaches to teaching and thinking through innovation design in education. Essentially, we were motivated by the idea that teachers, as well as students, could be motivated to “map” the way to change. 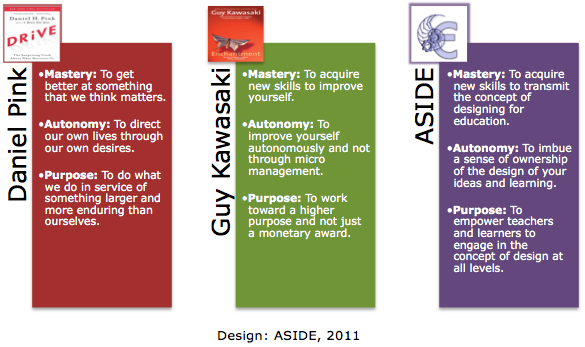 Our drive for mastery, autonomy, and purpose reflect a similar drive for motivating teaching and learning. When teachers and students both share in designing the learning, they are motivated to take responsibility, seek opportunity, and desire more.